Jade Byrne is a professional actor who has toured with Northern Stage Company, Company of Angels and Open Clasp Theatre Company. You’ll also know her from TV roles including those in Casualty, Inspector George Gently, The Dumping Ground and Mount Pleasant. She also has wonky-pancreas. 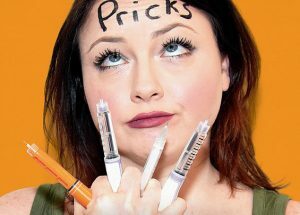 Jade is currently starting a run at the Edinburgh Fringe of her show Pricks which talks about the ups and downs of living with type 1 diabetes. Shoot Up: Your acting career is no stranger to the medical world with an episode of Casualty to your credit. Who did you play in that episode? Jade: I played Kelly Foster who was on a team building outward bounds trip and got her leg caught in a deer trap. Unfortunately they won’t be having me back, I died in the episode. Shoot Up: The BBC once filmed an episode of Casualty in my parent’s house in Bristol in about 1995. The plot revolved around a transvestite falling down their stairs. Cool, huh? Shoot Up: Anyway, enough about Casualty; you’re now doing your own show Pricks at the Edinburgh Fringe. Tell us all about it. Jade: Pricks takes you on my journey of pricks, be that finger pricks, injections, cannula insertions or the other connotation of pricks. It’s about family really and coping with illness. It’ll make you laugh and quite possibly cry too. Apparently it’s really captivating and moving, which is lovely to hear. Shoot Up: Your flyer says that you’re not bankrupting the NHS and you can eat a whole bloody cake if you want to. Do you feel there are a lot of misconceptions about type 1 out there? Jade: Oh yes of course I do and that’s exactly why I’ve created Pricks to get rid of the ‘mis’. It annoys me that the media constantly refer to type 2 diabetes as just diabetes. We are two quite different conditions. Shoot Up: Is it hugely satisfying to set the record straight on diabetes on stage? Jade: Yes, it definitely is. It’s really great to be educating people without lecturing them, that was always my point to educate through entertainment. Shoot Up: You started this run of Pricks a few days ago; how have audience reactions been? Jade: Well of the two shows I’ve done here so far the audiences have been very small but so lovely and most of them have gone away and immediately tweeted people about it or contacted me privately through social media to tell me how much they loved it, so that’s great and we’ve got twice as many tickets sold for today now as other days, which means it’s going in the right direction. I’ve only had one type 1 in so far in Edinburgh and she loved it but it’s great that I’ve got people in there who know nothing about type 1 diabetes and are loving the show. Shoot Up: Have you dispelled lots of diabetes-myths to our non-diabetic brethren? Jade: Yes, I certainly have. I do that very early on in the show. It was important to make sure the show set the record straight. Jade: I’m loving the Fringe. I saw Ed Gamble’s show the other night and he talks about type 1 a lot, it was brilliant. Errrm; not sure I feel sorry for the residents as there are loads of benefits for them. They’ve got a whole host of fab entertainment on their doorsteps. They can rent out their properties for astronomical prices and it’s also a huge boost to the city’s economy. Shoot Up: Now, getting down to the nitty-gritty. Geek us out about your diabetes set up? Jade: I have an Omnipod Pump and a Freestyle Libre. Only just got the Libre in time for Edinburgh though. The pump is the best decision I ever made. Shoot Up: Does the stress / joy / adrenaline of performing effect your diabetes? How do you cope? Jade: I’ve had a few hypos over the last few days. As you know everything affects type 1 blood sugar. I’m using my Libre graphs to alter my ratios on my pump. I’m decreasing my basal by 50% whilst I’m doing the show too and making sure I always have apple juice or Jelly Babies on me. Shoot Up: I see that Ed Gamble is also talking about his diabetes in his show this year. Who would win in a fight between you and Ed? Jade: Ah I didn’t see this question coming. [Tim – that’s our cunning interview technique, see] As I said his show is brilliant but I would definitely win hands down without any contest. I really want him to come and see my show, we’re on at the same venue so he bloody better! 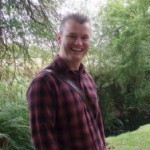 Shoot Up: Finally, turning to the important stuff – what’s your favourite hypo cure? Jade: Apple juice works quickest for me. I usually have a little carton in my bag. I think everyone’s different but apple juice is definitely the best for me. 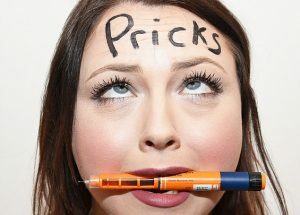 Jade’s show Pricks is on at The Cellar at the Pleasance Courtyard every day (aside from Wednesdays) at 14.15 and you can read all about it and see trailers on her website at https://www.prickstheplay.co.uk/. Internet geeks can follow Jade over on twitter.